Hello guys! At last I can represent to all of you my latest MOC. 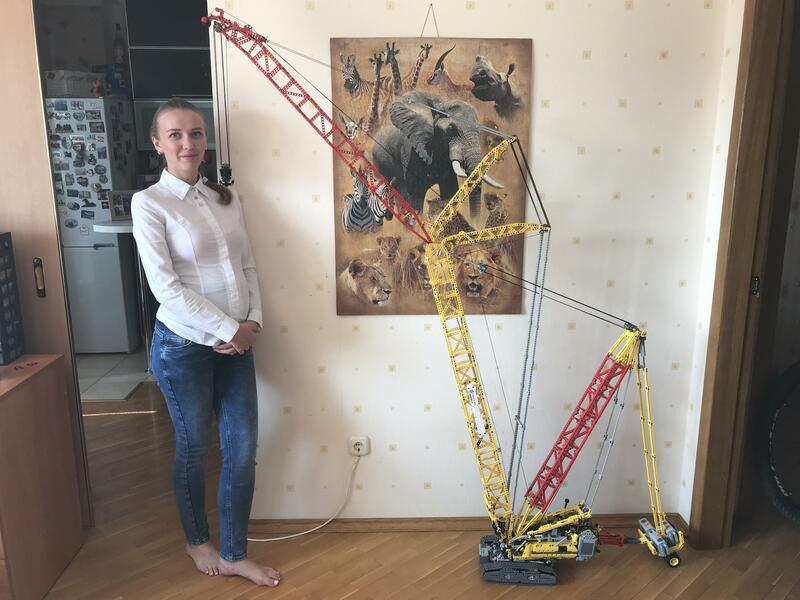 It's a Lego Technic Liebherr LR 11000 Crawler Crane. I tried to build a copy of a famous Liebherr-brand crawler crane. If to be honest it was my dream to build a human-high technic crane. This model is approx two meters high. It has five independent winches! Real crane has six, but two of them goes to one hook, what was not necessary to represent in lego version. Except string crane is build of 100% Lego. As a counterweight I used three big battery boxes in the superstructure and three ones in the additional counterweight carriage. Below I will list crane's functions. 1,2) Chassis drive and steering - one L motor for each track. 5) Chassis uplifting - chassis have installed four small linear actuators which can lift the chassis under the ground to put on tracks like in the real Liebherr!! As TLG doesn't have any pulleys of 0.5 stud wide and with the pin hole in the center and 3D parts are too expensive I decided to drill the original ones. All pneumatics are included in the parts list. I use tubes from 8110 & 42043 sets. Crane uses 3d party strings! You will receive building instructions of type PDF - Photo Sequence from the designer once you have organised payment with them. RC American Truck. Video Updated!